whack-a-mole Archives | Morgana Rae & Charmed Life Coaching, Inc. Feeling stressed lately? You’re not alone! The world has been feeling CRAZY. (Don’t get me wrong: my life is great.) But come on… haven’t you noticed challenges coming up a mile a minute this summer? 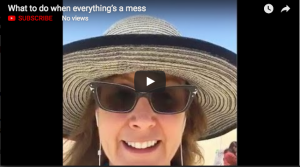 “After only three days in Morgana Rae’s Destination Retreat Blueprint, I feel as though I have learned/confirmed so much and simultaneously let such HEAVY things go! I feel light and energized for action!! It was such an amazingly validating experience! Not only did I get to listen and talk with some amazingly inspirational women, I am SO FRICKIN’ EXCITED to start putting the wisdom and insights I gained into action — for both the Money Date Mastery Retreat I’m planning for 2015 AND for the content/ strategy in between now and then!! !